Metaphase's innovative breakthrough design for Kellogg's "Drink'n Crunch" cereal-in-hand created an exciting new product category. An inner cup contains the cereal and the outer cup contains the milk. Cereal rolls into your mouth from the inner cup while milk flows into your mouth through the ergonomically designed mouthpiece sip hole -- your mouth is the bowl. Metaphase has received wide acclaim for their breakthrough design of "Drink'n Crunch". It was singled out as a top breakthrough innovation in food packaging in '04 receiving the Better Mouse Trap, Red Dot, Good Design, Dupont and Institute of Packaging Professionals Design Excellence Awards. 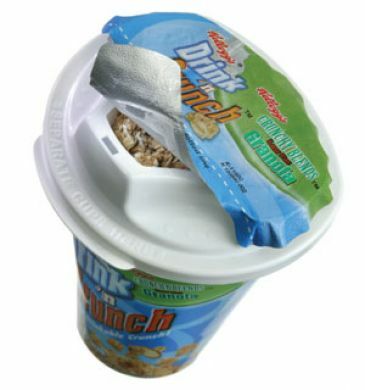 An inner cup contains the cereal - an outer cup contains milk. The outer cup is shaped to allow the driver to "see over" while driving, with grips scaled for hands of all sizes. The cereal & milk flow into your mouth simultaneously, so the cereal never gets soggy. Cereal rolls into your mouth from the inner cup combining with milk that flows from the sip hole in the form-fitting ergonomically designed mouthpiece. Agency: Metaphase Design Group, Inc.